In its clearance calculations, the UCR Program counts the number of offenses that are cleared, not the number of persons arrested. The arrest of one person may clear several crimes, and the arrest of many persons may clear only one offense. In addition, some clearances that an agency records in a particular calendar year, such as 2016, may pertain to offenses that occurred in previous years. In the nation in 2016, 45.6 percent of violent crimes and 18.3 percent of property crimes were cleared by arrest or exceptional means. 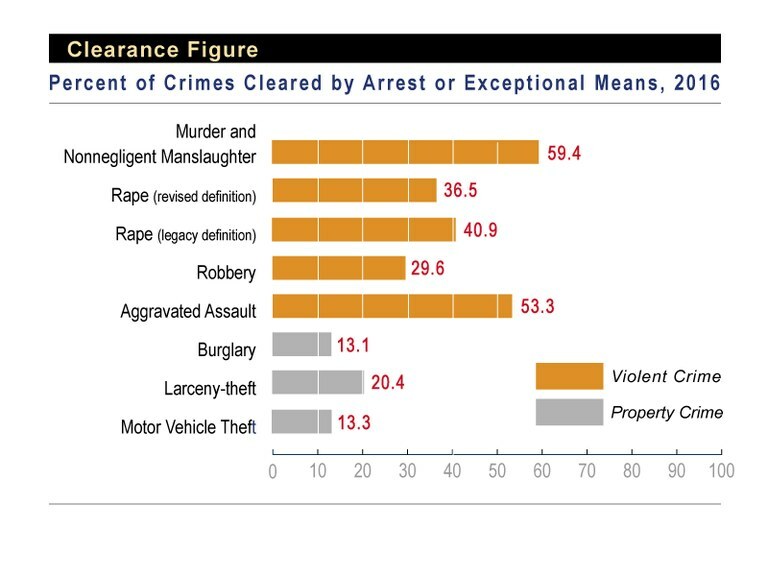 Among property crimes, 20.4 percent of larceny-theft offenses, 13.3 percent of motor vehicle theft offenses, and 13.1 percent of burglary offenses were cleared. In 2016, 20.8 percent of arson offenses were cleared by arrest or exceptional means.